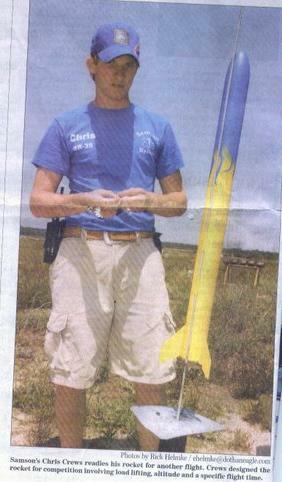 The Team America Rocketry Challenge (TARC) is the largest model rocket contest on the planet! Over 7000 students participated last year. Teams of 7th to 12th graders can apply. The rules and application for the 2008 Challenge are available on the TARC web site.The deadline for applications is November 30, 2007. Winners of this national competition will share in more than $60,000 in cash, savings bonds and additional prizes. TARC is proudly sponsored by the Aerospace Industries Association (AIA) and the National Association of Rocketry (NAR) in partnership with NASA, the Department of Defense, American Association of Physics Teachers and 39 AIA member companies. This year’s challenge is to design, build and fly a model rocket that carries two raw eggs to an altitude 750 feet and stays airborne for 45 seconds without cracking the eggs. Last year the Samson, AL qualified and attended the finals in The Plains, Virginia. This year’s contest is a great opportunity to involve students in a hands-on science/engineering project in a team environment.SEARS mentors are available to assist teachers and students interested in entering the 2008 TARC contest. We can help students with the general principles of model rockets and their construction. However, the students must design, build and fly their rocket entirely by themselves. They also need a teacher or other adult approved by the school principal. as the team supervisior. We I would be happy to meet with teachers and students and can give a rocketry demos if desired.We have prepared Taking on the TARC 2008 Challenge and Getting a Good Start on TARC for interested teachers and students. The student below is Chris Crews. He attended the 2007 TARC finals for the Samson, AL Team.